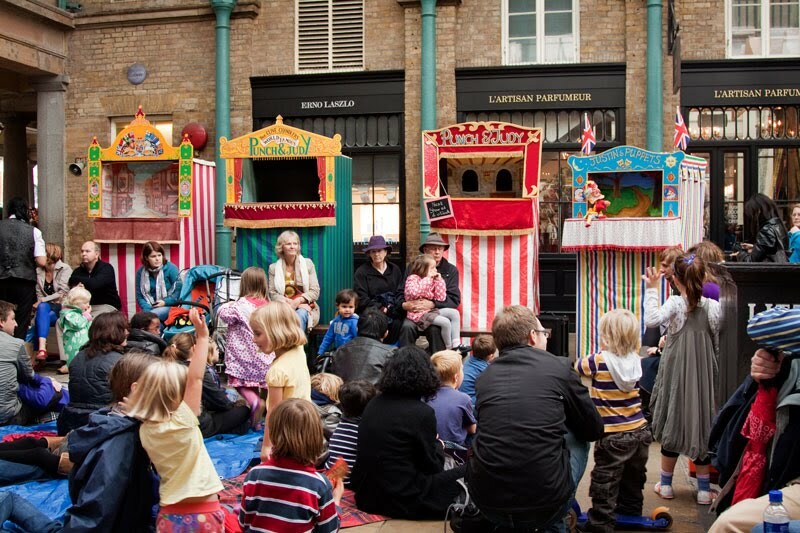 Punch and Judy punching it out at the annual convention in Covent Garden yesterday. Tomorrow I will announce the winner of Saturday's competition. You still have a few hours to enter. The seaside comes to town! How very colourful and I bet the adults enjoyed it as much as the children. Aw. I wish I could have seen this! They have all but disappeared from here. Love this kind of image. Beautiful. So colorful. Love the energy of this shot. Beneath those colourful Edwardian theaatres lurks all manner of violence and abberant behaviour. The highlight of the show is when Punch knocks Judy on the head. Not much has changed in chidlrens viewing preferences! Punch and Judy, so very English. But I didn't like the Punching bit when I was a kid. I was watching Midsomners murders, and they had a Punch and Judy in one of the episodes. Were you touring NZ or did you live here? I grew up with puppet theatre. Really would have liked to listen in. Classic European puppet theater. It's a shame we don't have them here in the US.